Technical advances in the production of glass influenced the development of window design. Early blown glass was replaced by spun glass in the eighteenth century and is still to be found in many historic buildings. It is characterised by irregularities, bubbles and defects. Modern sheet or plate glass, developed by the nineteenth century is largely free from such defects and so is no match for historic glass. Spun glass is becoming increasingly valuable and period glass is now available; for vernacular buildings agricultural glass may be used. Nineteenth century float glass allowed larger and more regular panes and simplified glazing patterns. 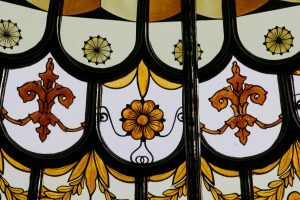 Inexpensive stained glass became available with a range of etched and patterned glasses and was widely used in hall doors, stairs and landings. Stained glass repair is best left to specialist craftsmen. The lead that separates the glass is prone to distortion, sagging and expansion buckling, especially in the larger frames. Sometimes the only solution is complete re-leading although it may be possible to sandwich an old, fragile window between sheets of plain glass. Conservators retain stocks of old glass for repairs. Modern safety regulations can demand that toughened or laminated glass is used in doors or low windows where a change of use or major renovations require Building Control Approval. This may be too thick for the old mouldings and its greenish colour changes the character. Secondary glazing or internal balustrades may be alternative solutions which preserve the character of the original. Historically, glass was invariably putty glazed and modern timber slips are inappropriate. For sound insulation, internal secondary glazing is most effective and although inappropriate for fine interiors, it does retain the integrity of the original windows. 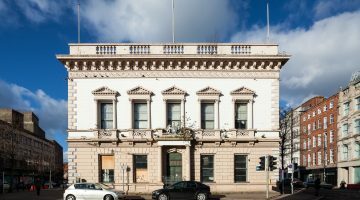 Secondary glazing of a suitable design will often be acceptable to NIEA for historic windows and frequently outperforms sealed units both thermally and acoustically. Where double glazing using sealed units has been acceptable, the use of specialist ‘slim’ units may be required; installed with a putty front to follow traditional glazing practice and appearance. Double glazing is not grant eligible through the DfC:HED funding scheme. Double glazing is not accepted for Heritage Lottery funded schemes.